Millions of girls worldwide, with the majority of them living in developing countries, are often denied their basic human rights, including healthcare and education, and are exposed to risks like child marriage, early pregnancy and sexual violence. Each year, around 17.4 million girls are forced into early marriage, which equals to 1 in every 2 seconds. Currently, 62 million girls are school dropouts. Millions of girls worldwide, with the majority of them living in developing countries, are often denied their basic human rights. 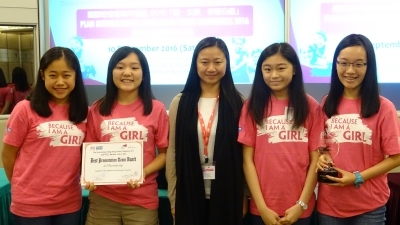 To encourage and inspire young people to speak about girls’ rights and to nurture global citizenship, “Plan International Hong Kong Youth Conference 2017” will continue with the theme ‘JUSTICE: Because I am a Girl’. Students will act as representatives of developing countries to introduce local girls’ situations and make suggestions for improvement. Students of Form 3 or above in this academic year (2016-2017) from the same school/organization can form teams to participate. Each team consists up to 4 students. Adjudicators will select not more than 16 schools/organizations to participate in the youth conference to be held on 16 September 2017 (Sat). Students are required to join two training workshops on 12 August (Sat) and 19 August (Sat) to enhance the knowledge and presentation skills through the advice of professionals, and will have the opportunity to visit and use the collections of the library of City University of Hong Kong. Outstanding students will also have a chance to visit a developing country or to participate in international campaign events as youth ambassador of Plan International Hong Kong. 16 teams of students from 7 local secondary schools participated in the conference last year. Plan International Hong Kong has organized ‘Plan International Hong Kong Youth Conference’ since 2015 with the Department of Asian and International Studies of City University of Hong Kong. 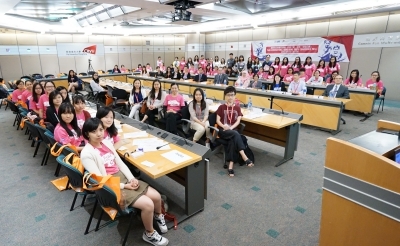 16 teams from seven local secondary schools participated in last year’s conference. The conference covered a broad range of topics including city safety for girls in India, child trafficking in Jamaica and sexual violence against children in Brazil. Students from Po Leung Kuk Yao Ling Sun College were awarded the Champion of Best Presentation Team last year. “Living in an era of information explosion, we have to pay attention to current affairs. More importantly, a sense of global citizenship has to be nurtured. Through this event, I understand that I can use speech to amplify my own voice and encourage others to care about girls’ issues,” awarded 2nd runner up of Best Presentation Team, Samantha Yuen from Heep Yunn School said. Representing one developing country, students from each team presented on different girls’ issues and made suggestions for improvement. Students from Heep Yunn School said that they learnt a lot from the conference. 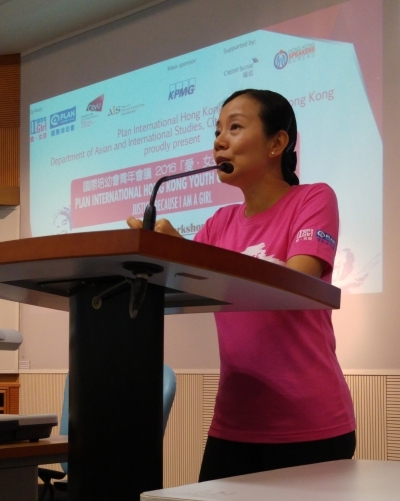 Ms. Kanie Siu, CEO of Plan International Hong Kong encouraged youngsters to become global citizens. Dr. Yuk-wah Chan, Associate Professor of the Department of Asian and International Studies of City University of Hong Kong; Mr. Chan-yau Chong, Director of EL Education; Mr. Sean Lin, Founding Speaker of Hong Kong Speakers Bureau and Ms. Kanie Siu, CEO of Plan International Hong Kong are invited to be the adjudicators and/or training speakers for Youth Conference 2017.